Steve Farber’s transplant journey inspired him to create the American Transplant Foundation. His story began when he was a toddler and suffered kidney problems. Miraculously, his failing kidneys began functioning again, and he recovered. Steve grew up in a lower middle-class neighborhood in Denver, Colorado. After law school, he co-founded Brownstein Hyatt Farber Schreck, a highly successful law firm. Yet Steve’s success did not help him when, at age sixty, his kidneys began to fail for the second time. Steve’s choices were to find a kidney, go on dialysis or die. He faced many obstacles in his search for a solution. He learned that his community stature could not be leveraged to move him up on the organ waiting list. He learned that people can pay for transplant organs in other countries; and he nearly went to Turkey to buy a kidney, but ethical and safety concerns held him back. Steve finally accepted the gift of life from his eldest son Gregg, who donated a kidney to his dad in 2004. The journey changed Steve. 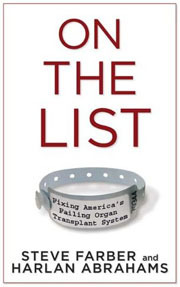 He co-authored On the List with Harlan Abrahams, a book expressing his goal of eliminating our nation’s tragic shortage of transplant organs. Steve strives to help families navigate difficult organ transplant issues, and the personal family challenges that come with it. He also wants to create better policy in America. He’s working toward new legislation and serves on the board of the Donor Alliance Council, the organ procurement organization that obtains and distributes transplant organs in Colorado and Wyoming. Steve Farber’s transplant journey inspired him to found the American Transplant Foundation together with Heidi Heltzel and Dr. Laurence Chan. It’s unique, because it does not focus on particular organs like kidneys or hearts or livers, nor does it limit its mission to enhancing donor awareness. The American Transplant Foundation goes beyond donor awareness to tackle the tough policy issues that must be solved to eliminate the gap between the need for organs and their supply. Only when that goal is reached will Steve Farber’s journey be complete. Watch the video below to learn more about the journey to creating the American Transplant Foundation. The Foundation is honored to present Steven and Gregg Farber with the Transplant Hero Award for their outstanding impact in the transplant community. Gregg’s decision to become a living kidney donor for his father, Steve, in 2004 began a lifelong journey to save lives for the Farber family. Steve committed to saving the lives of others in 2005 when he formed the American Transplant Foundation. This organization has changed and saved hundreds of lives by providing education and financial support. As a result, transplant patients, living donors and their families in 49 states have been provided lifesaving assistance.